This weekend we welcomed strangers into our home. They are artists from New Hampshire and Florida, two best friends who learned to paint together and now travel all over the U.S. to different Plein Air painting competitions. 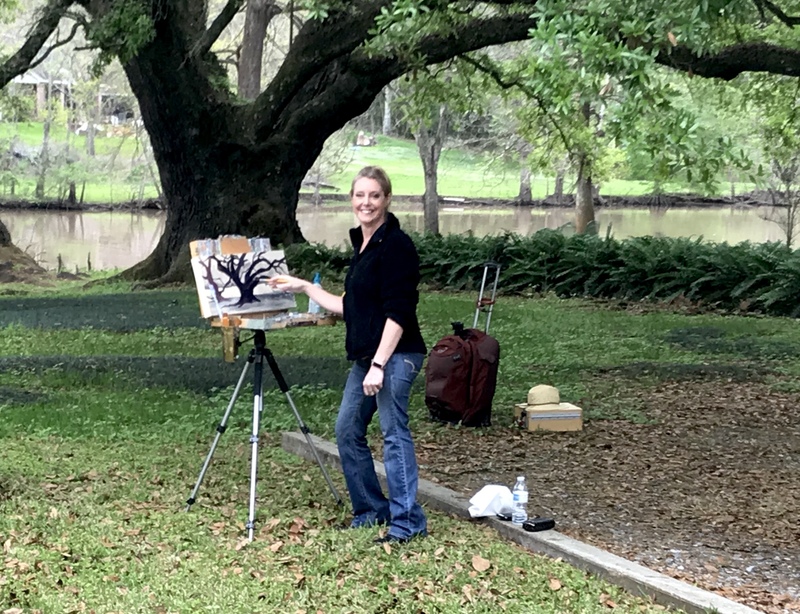 The Shadows on the Teche, a local historical plantation home, has a competition going on this week. Months ago we were asked to host two visiting artists, so Patricia and Deb arrived Saturday afternoon, total newbies to our area. I am enjoying seeing the beauty of our home through their eyes. Sunday afternoon we took them for a drive to scout out areas to paint in. En Plein Air is a French term for painting in the wild, outdoors. I have visions of creating an en plein air event for poets. Poets could partner with painters and write while the artist paints. Who’s game? I told Patricia and Deb to watch out because I will be writing about them. I look forward to seeing the art they produce and talking about art all week. The final show and auction will be Friday night. To learn more about the event, go to The Shadows on the Teche web page. 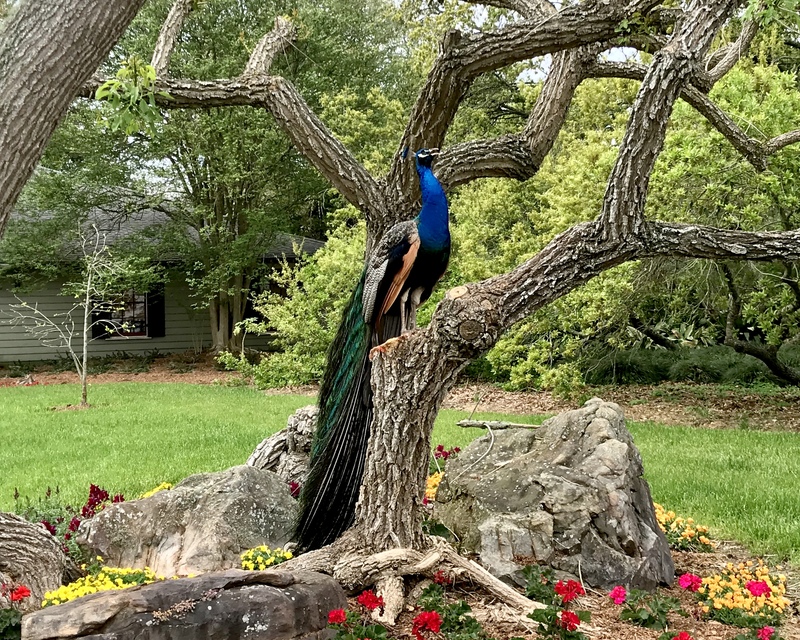 A peacock poses for his painting at Jefferson Island Rip Van Winkle Gardens. 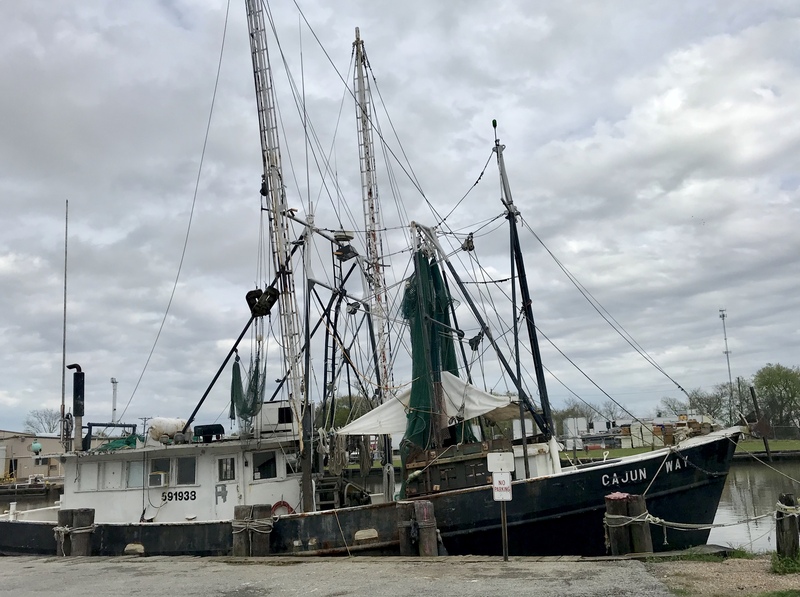 Shrimp boat in Delcambre may be a prime poser for traveling artists. “Grandmother oak”??? I love the tree, but now I want to know about its name! And the colors in the peacock picture. Our oak tree is 250+ years old. Live oaks over 100 get named and registered. Our visiting artist is painting her. I can’t wait to see the finished piece. Sorry you are still buried in snow. So curious about this . . . so named and registered. Does that include “mapping” by coordinates, names, and ages??? And is this everywhere in Louisiana? It is always surprising to see your world from another’s viewpoint. What a wonderful week for you and the artists! This is exactly what I want to do. I am going to read further from the links you included, maybe next year I can be there. The place looks so beautiful! The weather is absolutely gorgeous this week but our artists say they prefer cloudy to sunny. Lovely, lovely, lovely. Maybe the poets in plain air event will be my excuse to visit you! Always curious about that part of the world. Do you have to deal with flooding during hurricanes? We haven’t been flooded. It got pretty close in the 2016 rain event. It wasn’t a hurricane but a storm system that poured rain for 3 days. Ironically, my childhood house in Jackson, Mississippi flooded twice. Beautiful! I love the idea of doing this for poets … I’ve done that with 6th graders before, but would love to do it for myself! How like you to open our doors to art and artists, Margaret! I love your idea of creating an en plein air opportunity for poets and I’m so intrigued by your conversation with Fran about tree naming. Have a wonderful week! Always nice to see what my fellow New Hampshirites are doing! And I agree, an event like this with poets would be so fun! Grandmother Oak – who got to name her? And the shrimp boat – it looks like a relic. Is it currently a working shrimp boat? I’m thinking with all of those nets that it is. I agree, it will make a wonderful pose for the artists to paint. Your poet/artist event sounds great to me! You have some gorgeous scenes for painting en plein air! Your art/poetry idea sounds wonderful Margaret, hope to hear more about it. I’ve taught and worked en plein air for years. What a treat to open your home to these artists, for all involved! Sign me up for Poets in the Plain Air. When we were living in GA, there were times, when I will set my young artist’s easels in the backyard and let them paint away. I also had hanged up a line and we will clip the pictures on it for paint to dry. We have not done it for years now. I should try writing in the Plain Air once the snow thow out. Thanks for sharing and the idea.